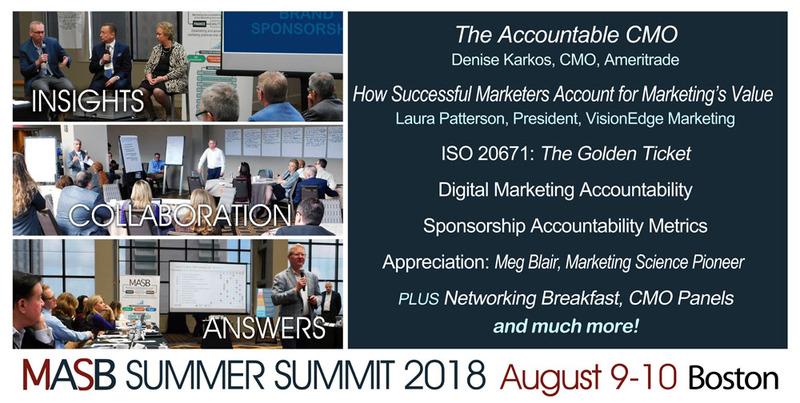 MASB is powering The Forbes Marketing Accountability Initiative to validate marketing’s contribution to growth. Marketing practitioners, academics and measurement experts are gathering to collaborate with peers and receive briefings on standards-setting projects, marketing research and education programs. The MASB 2018 Summer Board Meeting & Summit will be held at The Colonnade Hotel, 120 Huntington Ave, Boston MA 02116, 8 AM – 5 PM Thursday, August 9 (with dinner afterward), and 8 AM – Noon on Friday, August 10. To request an invitation, use the link below or email info@themasb.org. Reduced-rate hotel rooms are available through July 25!